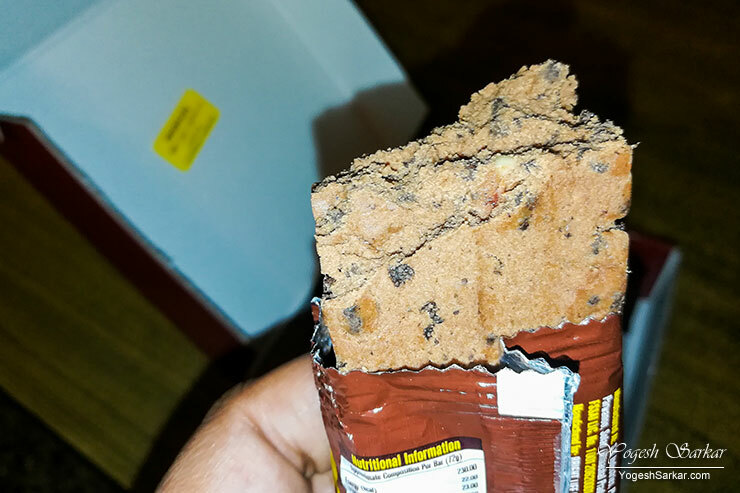 MuscleBlaze has recently launched their Protein Bar (Choco Delight) after a long leave of absence from the protein bar market when they stopped selling their Power Bars a couple of years ago. 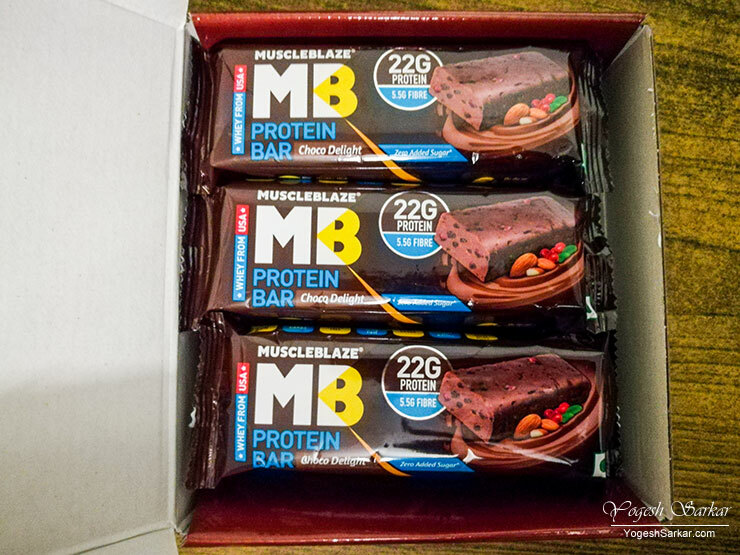 This is a short review and my view on MuscleBlaze Protein Bar. I love protein bars, even if I am not exercising and dieting. For the simple reason, they are a fantastic and healthy way to fill your stomach, when you’re out and about and hunger strikes. I used to carry MuscleBlaze Power Bar on photo shoots and trips, including to Ladakh, where on the early morning shoots, it kept my stomach full and body warm. After all, it isn’t like only the bodybuilders or athletes need protein. It is an essential macronutrient that everyone needs and the vast majority of protein bars are an excellent meal replacement or even a snack for anyone looking for a healthier alternative to chocolates, biscuits and other forms of snacks on the go. So, when I came to know, MuscleBlaze has launched its Protein Bar, I ordered a six pack. Each 72 g MuscleBlaze Protein Bar contains 22 g of protein, 9.5 g of carbs, 5.5 g of fiber and 6.8 g of fat and gives you 230 calories (same amount as a couple of bananas) and added vitamins and minerals. 22 g of protein is made up of a blend of Whey, Milk Protein, and Soy Protein. I would have loved to see only Whey or a blend of Whey and Milk Protein being used in this protein bar since I do not feel soy protein is good and it can have long-term health effects if you’re consuming it on daily basis. Nevertheless, it is likely safe if you’re consuming it once in a while, which is exactly how I intend to use it. After all, at Rs. 91.5 per bar (based on the current price of a six-pack), it isn’t exactly cheap enough to be used on a daily basis for most people. On the plus side, thanks to honey, cranberries, and almonds (which weren’t present in the power bar), the taste of the MB Protein Bar is quite good and crunchier than most protein bars. It is fulfilling as well, and a single protein bar was enough to keep the hunger pangs away for a couple of hours or more. Though you need to drink water with this, otherwise your mouth can start feeling dry while eating this protein bar. 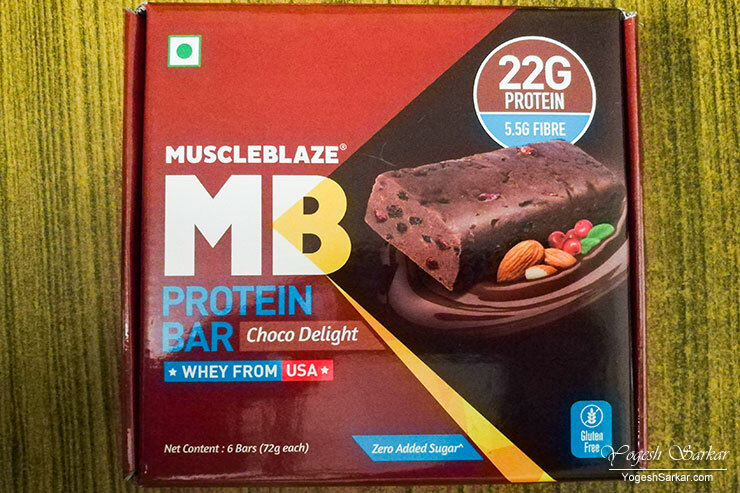 On the whole, I really liked the MuscleBlaze Protein Bar and I have started carrying it in my bag, even when I am traveling in Delhi. On a trip, of course, it is going to be a perfect companion like the power bar earlier.